This Divine chocolate bar is a dark chocolate lover’s dream. Take a bite and taste the bold 85% chocolate content; accented with a cluster of even more chocolatey bliss. There are chocolate nibs throughout the bar to give you a big, delicious dose of chocolate with every square. This bar is made in Germany following a vegetarian and vegan friendly recipe; made up of organic ingredients sourced from farms that operate with a fair trade work ethic. 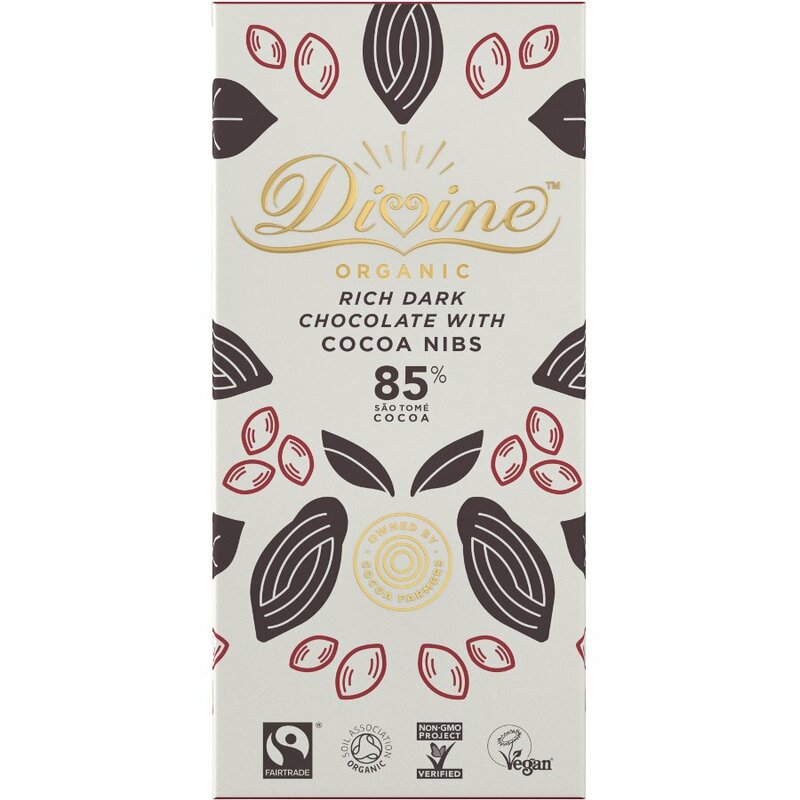 Divine chocolate believes in sustainable farming and in sustainable livelihoods for those who provide the ingredients, which is why every bar is printed with the official FairTrade label. Cocoa mass*, sugar*, cocoa butter*, 6% cocoa nibs*. Cocoa solids 85% minimum. *From organic agriculture, certified by DE-OKO-013. MAY CONTAIN: milk, cereals containing gluten and nuts. There are currently no questions to display about Organic 85% Dark Chocolate with Cocoa Nibs - 80g.